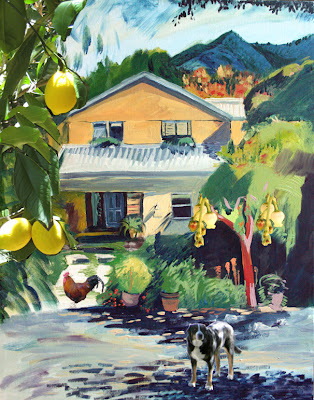 "Fairfax Fresh Lemons" o/c 16" x 20" Plein air painting at Fairfax Fresh, a Marin Organic Farm run by Patti Elliot. I painted with Patti today, and enjoyed the views of Mt. Tam, the changing light and the dogs. I created this montage of images this evening in Photoshop, as I would like to include the lemon branches, rooster and dog in the painting. Sometimes, I do combine images in Photoshop, and then paint from these prints. It is always best to work on site, plein air, to start, so you get the best colors/contrast and natural lighting. Then, I can add details, such as the dog and lemons, from my photos in the studio back at home. This is the second painting produced from Fairfax Fresh location, and I am sure it will not be the last- It is a wonderful spot to paint, with great company too!